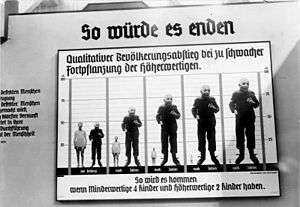 Nazi eugenics were Nazi Germany's racially based social policies that placed the biological improvement of the Aryan race or Germanic "Übermenschen" master race through eugenics at the center of Nazi ideology. 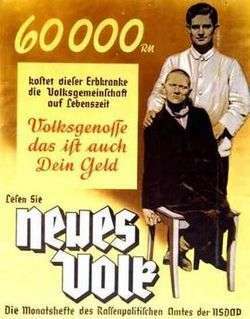 Those humans targeted for destruction under Nazi eugenics policies were largely living in private and state-operated institutions, identified as "life unworthy of life" (German: Lebensunwertes Leben), including prisoners, degenerate, dissident, people with congenital cognitive and physical disabilities (including feebleminded, epileptic, schizophrenic, manic-depressive, cerebral palsy, muscular dystrophy, deaf, blind) (German: erbkranken), homosexual, idle, insane, and the weak, for elimination from the chain of heredity. More than 400,000 people were sterilized against their will, while more than 300,000 were killed under Action T4, a euthanasia program. Wir stehen nicht allein: "We do not stand alone". Nazi propaganda poster from 1936, supporting Nazi Germany's 1933 Law for the Prevention of Hereditarily Diseased Offspring (their compulsory sterilization law). The couple is in front of a map of Germany, surrounded by the flags of countries which had enacted (to the left; the United States and the Scandinavian countries) or were considering (bottom and to the right) similar legislation. After the eugenics movement was well established in the United States, it was spread to Germany. California eugenicists began producing literature promoting eugenics and sterilization and sending it overseas to German scientists and medical professionals. By 1933, California had subjected more people to forceful sterilization than all other U.S. states combined. The forced sterilization program engineered by the Nazis was partly inspired by California's. In 1927, the Kaiser Wilhelm Institute for Anthropology (KWIA), an organization which concentrated on physical and social anthropology as well as human genetics, was founded in Berlin with significant financial support from the American philanthropic group, the Rockefeller Foundation. 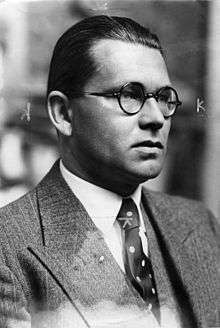 German professor of medicine, anthropology and eugenics, Eugen Fischer, was the director of this organization, a man whose work helped provide the scientific basis for the Nazis' eugenic policies. The Rockefeller Foundation even funded some of the research conducted by Josef Mengele before he went to Auschwitz. The racialism and idea of competition, termed social Darwinism in 1944, were discussed by European scientists and also in the Vienna press during the 1920s. Where Hitler picked up the ideas is uncertain. The theory of evolution had been generally accepted in Germany at the time but this sort of extremism was rare. In 1934, the first year of the Law's operation, nearly 4,000 persons appealed against the decisions of sterilization authorities. A total of 3,559 of the appeals failed. By the end of the Nazi regime, over 200 Hereditary Health Courts (Erbgesundheitsgerichte) were created, and under their rulings over 400,000 persons were sterilized against their will. Bachrach, S. (2004). "In the name of public health — Nazi racial hygiene". New England Journal of Medicine. 351 (5): 417–420. doi:10.1056/nejmp048136. Biddiss, M. (Jun 1997). "Disease and dictatorship: the case of Hitler's Reich". Journal of Royal Society of Medicine. 90 (6): 342–6. O'Mathúna, D. (Mar 2006). "Human dignity in the Nazi era: implications for contemporary bioethics". BioMed Central. 7 (1): E2. doi:10.1186/1472-6939-7-2. PMID 16536874. Weigmann, K. (2001). 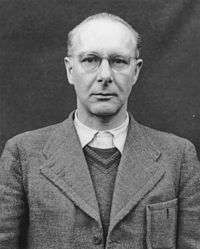 "The role of biologists in Nazi atrocities: lessons for today's scientists". European Molecular Biology Organization. 2 (10): 871–875. doi:10.1093/embo-reports/kve217. PMC 1084095 . PMID 11600445. ↑ "Close-up of Richard Jenne, the last child killed by the head nurse at the Kaufbeuren-Irsee euthanasia facility.". United States Holocaust Memorial Museum. Retrieved July 29, 2011. ↑ Snyder, S. & D. Mitchell. Cultural Locations of Disability. University of Michigan Press. 2006. ↑ Gretchen E. Schafft, From Racism to Genocide: Anthropology in the Third Reich (Urbana and Chicago: University of Illinois Press, 2004), pp. 48-54. ↑ Robert S. Wistrich, Who's Who In Nazi Germany (New York: Routledge, 2001), p. 60. 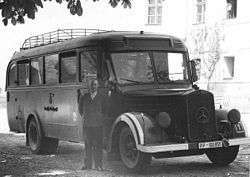 ↑ In 1933, Adolf Hitler appointed Fischer rector of Frederick William University of Berlin, now Humboldt University. See: "Rektoratsreden im 19. und 20. 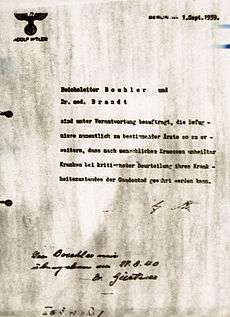 Jahrhundert – Online-Bibliographie", der ehemalige Friedrich-Wilhelms-Universität Berlin. ↑ In 1876 Haeckel had discussed the selective infanticide policy of the Greek city of ancient Sparta. Haeckel, Ernst (1876). "The History of Creation, vol. I". New York: D. Appleton. p. 170. Among the Spartans all newly born children were subject to a careful examination or selection. All those that were weak, sickly, or affected with any bodily infirmity, were killed. Only the perfectly healthy and strong children were allowed to live, and they alone afterwards propagated the race. ↑ Knittel,S. "Remembering Euthanasia: Grafeneck in the Past, Present, and Future." B. Niven & C. Paver [eds]. Memorialization in Germany since 1945. New York: Palgrave MacMillan, 2010: 124-133.